"Tuna tossed with noodles, peas and pimiento in a creamy sauce is baked until bubbling with crunchy crumb topping." 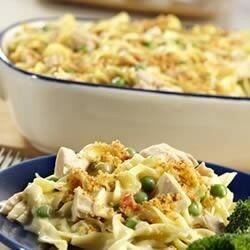 Mix soup, milk, peas, pimiento, tuna and noodles in 1 1/2-quart baking dish. Mix bread crumbs with butter. Sprinkle on top. Bake 5 minutes or until hot. *Or use Campbell's® Cream of Mushroom OR 98% Fat Free Cream of Mushroom Soup. Serve with your favorite frozen vegetable combination. For dessert serve ice cream. To melt butter, remove wrapper and place in microwave-safe cup. Cover and microwave on HIGH 30 seconds. I added a 3rd can of tuna as it seems the cans have gotten smaller. This is a good base recipe that does need some salt. Next time I prepare it I plan to add more seasonings to it.